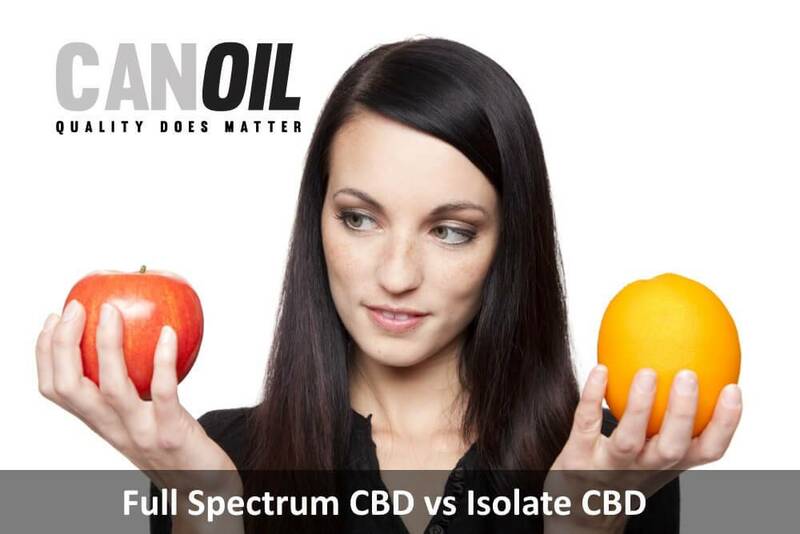 The Difference CBD Isolate CBD Oil and Full Spectrum CBD Oil? The market is currently being flooded with CBD brands and companies. Nowadays there are so many companies selling CBD in all kinds of forms like oils, e-liquids, tinctures, ointments and balms, food and crystals or powders. It is always important to be well informed before using CBD. In an unregulated market such as the CBD industry, this is very important. Since there is no legal advice that CBD can help with, guidelines and regulations regarding the production and labelling of CBD products are very important, it is up to us as producers to be as transparent as possible to build trust with our customers. That said, we always advise customers to take the time to learn the basics about CBD. We recommend before you start with CBD to understand some key terms such as full spectrum and isolation. In our previous post, we explained what CBD does to your body, if you haven't read this article, check out the page "What does CBD do to your body? View the Scientific Explanation Why" here. What does CBD Full Spectrum mean? When a CBD product is referred to as a full spectrum, it means that it contains all other cannabinoids found in the source plant. Thus, the extraction process used on hemp or marijuana pulls the CBD out of the plant, as well as the other cannabinoids contained within it. CBD Isolate is just about what the term indicates - only CBD, purified and separated from all other cannabinoids found in the source plant. What is the difference between CBD Full Spectrum and CBD isolate? The difference between CBD Full Spectrum and CBD isolate is that CBD Full Spectrum contains more cannabinoids that reinforce each other and work more effectively than CBD isolate that only contains CBD cannabinoids. The question we often get is "Wouldn't CBD isolate be better, because you could get more of the cannabinoid that holds such a medicinal promise" Although it may seem counterintuitive, several studies so far suggest that full-spectrum CBD is much more effective than CBD isolate. A remarkable study is from the Lautenberg Center for General Tumor Immunology in Jerusalem. The study investigated the effectiveness of isolated CBD (isolate) versus full CBD extract (Full Spectrum). This study concluded that CBD isolate produces a bell-curve of effectiveness (it becomes less effective after a certain point), while full-spectrum CBD remained effective in providing pain relief with an increase in dosage. All tests performed for this study indicate that CBD isolate is only effective at a given dose, while full-spectrum CBD continues to provide relief as the dose increases. The study found even more interesting results; in fact, that full-spectrum CBD extract has properties that can help relieve pain not found in general anti-inflammatory drugs. You can read more about the study, methods and results here. The use of a full-spectrum CBD product enables what scientists call the 'entourage effect'. In fact, it is claimed that CBD works more effectively in the presence of the many other cannabinoids found in cannabis. And that's why we choose to use only full-spectrum CBD oil for our products! The information on this page about the use of cannabinoids (CBD) is intended as a choice aid for people who want to use cannabis as self-medication. Our express advice is to ALWAYS discuss this with your dokter first. We make no medical claims. The information on this page is not intended to diagnose, treat, cure or prevent disease.